while evacuating from new orleans in anticipation of hurricane katrina, the owner of this project, a new orleans native, discovered the often-overlooked region of central louisiana and came to appreciate its different soils, rolling hills, and the rural culture of the earth there. 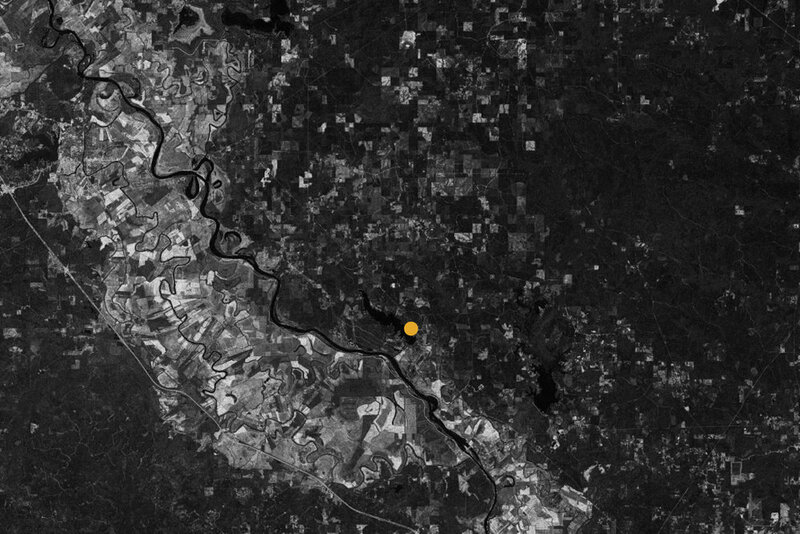 for eight years following katrina, he searched for a plot of land to be developed as a combination evacuation pad, satellite studio, nature retreat, and fishing camp. finally, he settled on a property with ample frontage along nantachie lake, just a few hours north of the city. the concept for the camp at nantachie is influenced by select vernacular language. in a sense, the project is an occupiable garage--a ”carporch”--designed to house the owner’s rv. the edge of the enclosure between conditioned indoor space and the porch outside is entirely operable, which blurs the distinction between indoor and outdoor existence. 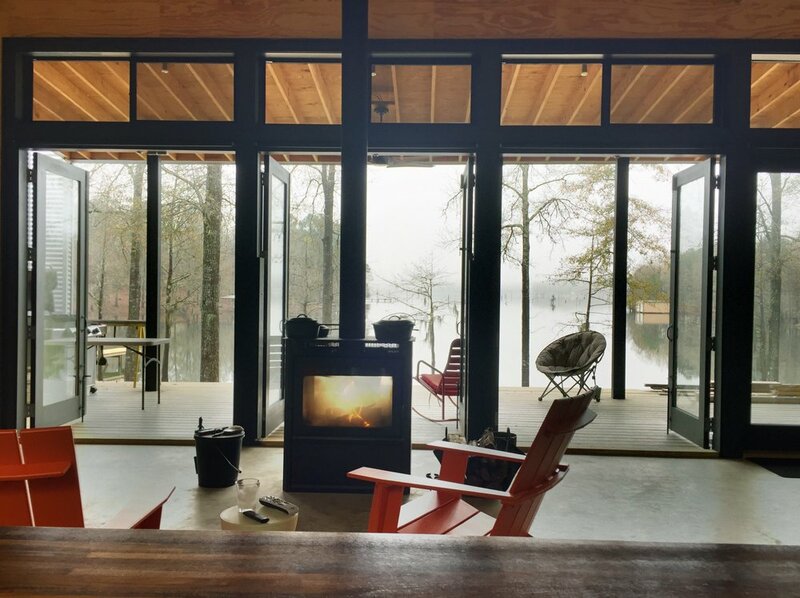 a south-facing porch overlooks and frames a view to the lake; its roof shades the bank of operable doors and creates a comfortably occupiable, exterior extension of the interior space. the owner built this project over four years of weekend visits, with periodic help supplied by local tradesmen. design and construction began with an initial simple volume which would later receive an applied deck and roof. the camp’s location amidst thousands of acres of pine forests, where pine is the predominant industry of the region, greatly influenced the selection of interior and exterior cladding materials. however, where pine could not withstand direct exposure to the elements, a common corrugated metal cladding was used in response to severe sun and rain. 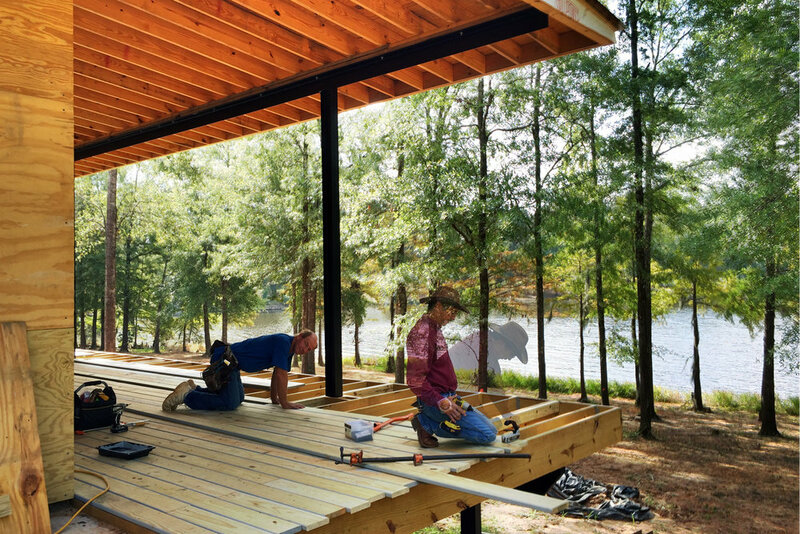 as originally intended, the shed now serves a multitude of purposes--it’s a country office and retreat, evacuation destination, and entertainment pad where cooking and entertaining activities take place both inside and out; finally, the swampy freshwater cypress lake filled with cypress stumps not only provides beautiful waterfront views but makes the shed a perfect fishing camp for the owner’s favorite outdoor pursuit.